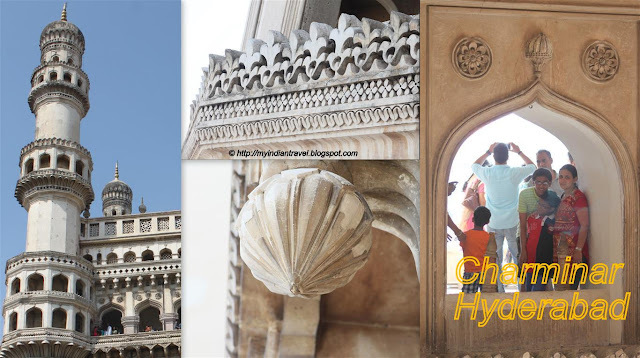 The Charminar in Hyderabad, is a historic monument as well as mosque that is visited by tourista all over the world. The ruler of the Qutb Shahi dynasty Sultan Muhammad Quli Qutb Shah built this magnificent structure in 1591. It is part of old city and was constructed at the intersection of the historical trade route that connects the markets of Golkonda with the port city of Machilipatnam. It is built using Indo-Islamic architecture style, incorporating Persian architectural elements. It is constructed using limestone, mortar and marble. It is a square structure with each side having 66 feet wide grand arches in the four directions. There are 149 winding steps inside each of the minaret to reach the upper floor. The minarets at each corner are exquisitely shaped with three storeyes rise to a height 0f 56 meters. Each minaret is crowned by a bulbous dome with dainty petal-like designs at the base. The mosque is located at the western end of the open roof; remaining part of the roof served as a court during the Qutb Shahi times. The interiors of the dome is beautifully carved. The clock on the four cardinal directions was added in 1889. At the base of Charminar there was originally a water cistern at the center with a small fountain. The every inch of the structure is beautifully carved. As usual we m in awe of the craftsmanship and art and beauty, especially when I think of the year this elegant masterpiece was created. Beautiful building with beautiful designs. Have a great day! Such an amazing ancient building in the middle of what seems to be now a very busy intersection full of many people going about their daily lives. Fascinating. How incredible is this? You can even go upstairs. That's a lot of stairs to climb up to the minaret but I imagine you would be rewarded with excellent views. Wow - this is extraordinary. You must be given some funds by your Tourism office, as your blog is all about your India. Rajesh, sorry I've not had a chance to visit your blog in a few weeks, but I always look forward to the new places you take me to when I do. This is absolutely stunning - thanks for the tour. Amazing buildings, wonderfully photographed though. The part of the world you live in has so many beauty! Beautiful detail on this building. I like the arch within an arch effect! It´s beautiful, I like it. Rajesh - thanks for sharing this architectural masterpiece. Amazing to think it was built in 1591! awesome blog..enjoyed going thro your travels and photography! What a majestic place to visit, and lovely photos indeed. Warm greetings! It amazes me that something like that could be build in 1591. How in the world did they get up there to work on the building. They certainly didn't have all the construction equipment available today. Such intricate detail. It was definitely built to last. I can't imagine something build today lasting that long. So beautiful! I love stunning architecture like this. It's something you could just keep looking at for a long time. Did you climb the 149 steps? Love the architecture and built in the 1500s. Amazing how it has stood up to the elements and time itself. Thanks for supplying all the information too. That gate is simply beautiful.